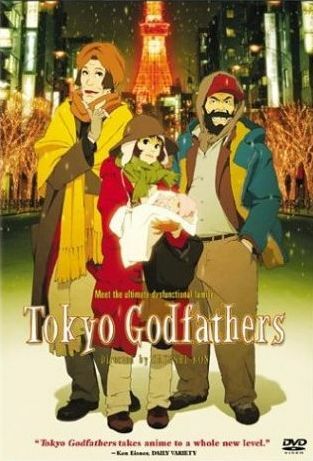 Tokyo Godfathers takes place on Christmas Eve in the city of Tokyo, and tells the story of three homeless people. The middle-aged Gin, a former drag queen named Hana (who wishes to become a mother), and a High school runaway named Miyuki. Each of them carry a burdoned past. On this very night, while searching the dumpsters for possible Christmas gifts, they find an abandoned baby. Believing its a gift from God, the three begin a quest to find the baby's mother. On a possbly hopeless quest, these three individuals are hoping to achieve a little Christmas miracle of their own.